My newest post is going to be a reflection of my first full year of being a Latvian. However, this short post will be a quick explanation of the barefoot trail of Valguma Pasaule. The bad news is there will not be many photos. This weekend, we rented a car so that we could travel to Aluksne to prepare graves at the cemetery for Kapu Svētki . I met Rita’s sister and her nephews near Cēsis. 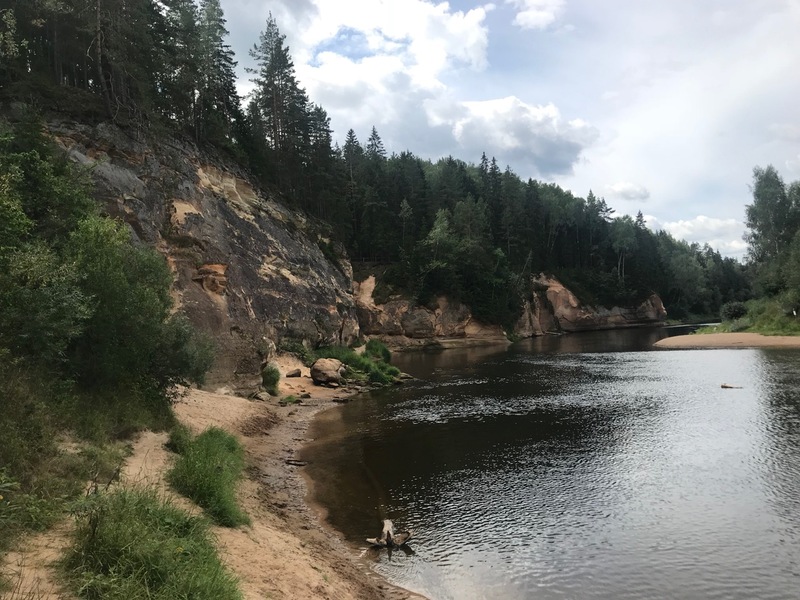 We saw a lovely cliff on the Gauja River and got rained on in Aluksne while exploring the new park and the ruins of the castle. Then, on Sunday, Rita wanted to go to the seaside and she found this interesting sounding park that was on the way. “Do you want to go to this place?” she asked me, showing me a photo of people walking on rocks in their bare feet. Of course I want to go to there! We drove with no expectations. Later, we both admitted that we thought we would see nobody else at this strange attraction. Who else would want to spend their Sunday walking on a path through a forest with no shoes? Seems like a niche market. Not in Latvia! As I turned the Hyundai down the narrow road leading to the park, we saw cars parked on both sides of the road and a young man guiding people into parking places. What is going on? Some festival? Nope. People just want to walk barefoot. We walked quite a way just to get to the park entrance where we saw dozens of people and hundreds of pairs of shoes on shelves. Who knew? In true Latvian fashion, however, there wasn’t a line to get tickets, and there was no queue to enter the path. Have I mentioned how much I absolutely love not having to wait in lines? 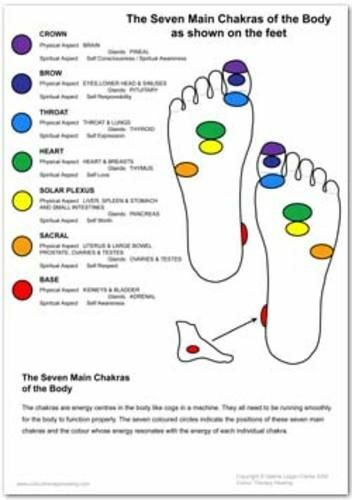 At the start of the path, there was a diagram of the human foot and some explanation of the 7 chakra (chakras?). The concept, I guess, is that if we massage and stimulate parts of the feet, then our whole body (mind and soul) will benefit. And different parts of the feet going under different stimulations will lead to some unleashing of a healthy kamehameha blast from the chakras in our spirit animal blazing through the universal path of primordial existence… or something. Rita and I left our shoes and most other belongings at the start of the path. I did not take a phone, so there are no photos. I felt like this should be a quiet, spiritual adventure. Unfortunately, many other participants were not on a mission to find inner peace. Screaming kids, loud Russians, and even louder Lithuanians attempted to keep us from finding our true chakra (I am guessing I am getting this all wrong), but we did our best to practice patience and focused our energies inwardly as we began our walk. The path itself was beautiful. It is deep in the heart of the Ķemeri national park where the pine trees grow tall, and you can really breathe and feel in tune with the earth, even without all the other stuff. But other stuff there was! The walk began with some troughs of various substances to get your feet wet (ha ha, see what I did?). We walked through a couple of types of mud, and then the real challenge began with sharp rocks of various sizes. I cannot recall how far we walked on how many different rocks all told, but my feet remember each and every one. The total length of the trail is 3 kilometers. The trail is divided into the the 7 chakras, and each section focuses on a different level of pain (i.e. “awakening”). After walking on rocks and pine cones (my god… pine cones! ), I could feel this tingling all throughout my body. It is hard to explain, but I definitely felt more in tune with myself. I was focusing only on my walking and letting everything else fade away. I compare the experience to rock climbing, and it provided the same kind of pleasure and pain combination. You are so focused on what your body is doing that your mind does not wander and fill itself up with baggage. Instead, you simply feel the moment and you are in the moment. My favorite part of the trail was the truly challenging part where you walk on these large poles (think telephone poles) rising up out of the ground, up a cliff side and back down. Most people were using these taller poles to hold themselves on the foot path, but I was really just focusing on using my feet. Each step slow and balanced. Without the handrails, you really get a sense for where your feet are and how your body aligns and balances itself. Just like climbing. All throughout the journey, we were surrounded by people. There were mostly families with kids who were just enjoying the walk, but not really seriously focused on their chakra. I would love to do the path again in silence. There were photos along the way of the mythical Latvian squirrel with promises of seeing wildlife. We didn’t see any, and I am pretty sure that everyone was just a bit too loud for the humble, introverted Latvian furry creatures. At the midpoint of the path somewhere in the 3rd chakra is the labyrinth, a spiral of various stones starting with large bumpy ones to small, white gravel. Rita was getting tired of the pain caused by the big rocks, but I vowed to maintain my strength. For the life of me, I can’t figure out how foot pain works. I know that my feet are not being seriously damaged by these rocks. I know the pine cones are not inflicting any real punishment, but the level of uncomfortability is impossible to withstand after awhile. Why is that? The only bottleneck of the path was when we came to this sea-saw. The goal was to slowly walk across and balancing it as you went. It was not very difficult to do, and Rita pointed out that the point wasn’t the sea-saw, but the patience before getting to it as we stood in line for many minutes. I really felt that. Somewhere in the 5th or 6th chakra, after crossing the stream and feeling the passion to just jump in again and wade around, we came to the boxes of broken glass. I told Rita that if we had come to the broken glass at the start, I probably would have skipped it. I forgot to mention that at every station, there was always an alternate route to avoid the pain and discomfort, which is smart. But now, after surviving so many rocks and pine cones, the glass was not as scary. It was polished and smooth, and there was no blood, so I figured I would be okay. So we walked on glass and corks alternating between the two. After, we were rewarded by this soft rubber section that felt like heaven. The final sections took us around a beaver dam and near the lake. It was literally one of the most beautiful landscapes I had ever seen. An airshow was going on nearby, so the peacefulness was abruptly shaken by fighter jets doing maneuvers over our heads. What a contrast! The most difficult part of the entire journey came toward the very end. There was a little house with large feet glued to the wooden surface. On each foot was this plastic sheet that looked harmless and almost inviting. I thought it was going to feel like a nice massage with soft plastic bristles. I was so very, very wrong. The plastic was hard with points like little daggers. Stepping onto one of these caused pain to wrack my body. One kind Latvian woman was walking on them and encouraging me saying how great it felt. I tried, and was able to make it half way around, but I did not find it pleasurable. Rita sat in a chair with the back made of these plastic torture devices. She assured me that it was refreshing, but I didn’t want to find out. The last leg was the 7th chakra which, according to one website, is at our crown and unlocking it means we conquer suffering and death. Cool. So this challenge wasn’t as much physical as it was mental and spiritual. We walked through a doorway and into a trough of grain. This was truly the most pleasant part of the walk. I loved the feel of my tired feet in the soft warmth of these tiny, edible grains (one kid was eating them… I was wondering where all the birds were). Then, we ascended the final staircase which was made of actual Latvian millstones each associated with a family name. How amazing is that? You climb to the end, foot fall to foot fall, on these ancient stones that once ground grain into flour which made bread for people who lived hundreds of years ago. It is so poetic. So wonderful. I forgot also to mention that the path had mirrors at the start, so you could see yourself walking. Then, along the way, there were mirrors to show your feet as you walked. This theme of mirrors was also interesting. At the very end, the final doorway had a mirror so you could see yourself successfully completing the journey. I took a moment to truly smile and appreciate everything about life, the universe, the past, present, and future. Then we walked forward, and I was completely disoriented. It wasn’t until I saw the shelf of shoes that I realized we were exactly where we started. After completing the course, I understand the appeal. I would definitely like to do it again! 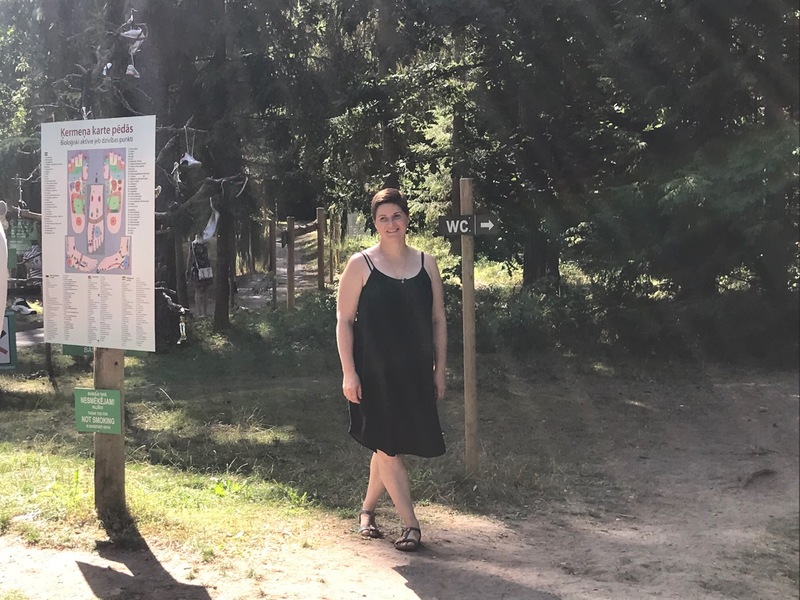 For only 5 Euros, my chakra were opened, I had a 2 hour nature walk, and I felt in tune with myself. I would like to try a longer, more peaceful walk some day! And if you are ever in Latvia and have a few hours to kill, I highly recommend! The name Valguma Pasaule comes from the name of the lake. Rita says that “Valgums” means the feeling that a light breeze gives you on a hot day. The literal translation from Tilde is “stillness.” “Pasaule” means world, so put together you have Stillness World. I think that pretty much sums up the experience. Oh, and after you finish, there is an ice cream stand. Ice cream has never tasted better!